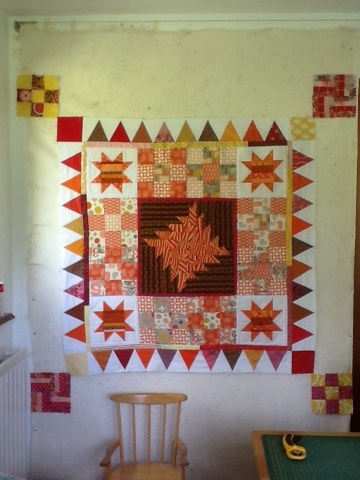 I thought I should try something different to my now usual method of using a central block as a medallion quilt, from donated orphan blocks. 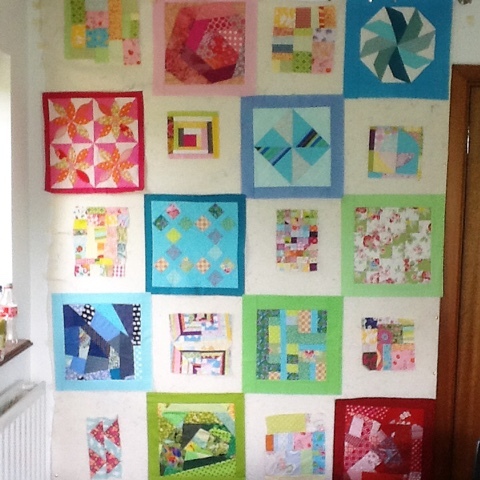 I had lots of blocks this time: one made by me; some by my beemate Catherine; but most from Carina as you can see in the photo below! There didn't seem to be much tying them together. 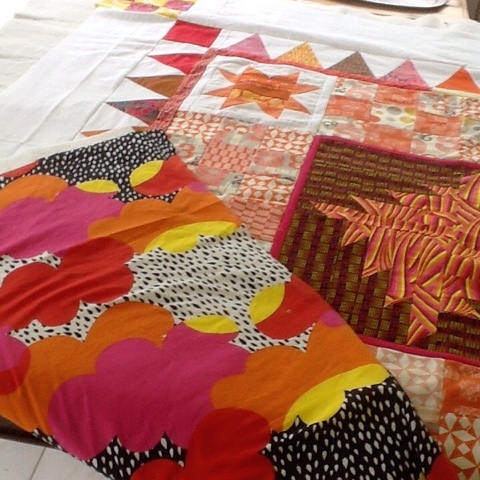 All different shapes in them, different methods of construction...how could they come together in one quilt? 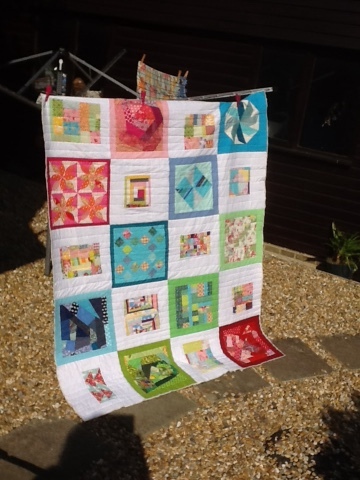 While thinking they might each need their own quilts, which I didn't have time to make - no not even me! - I saw that some did have colours in common. Some green, some pink and some blue. Then there were others that had all of those colours! 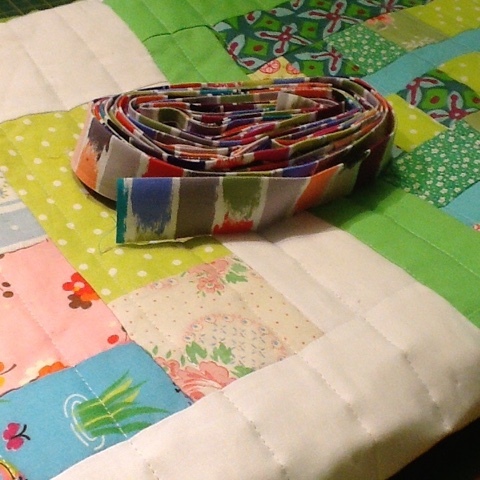 And that is how I began making diagonal lines of blocks in colour bands. 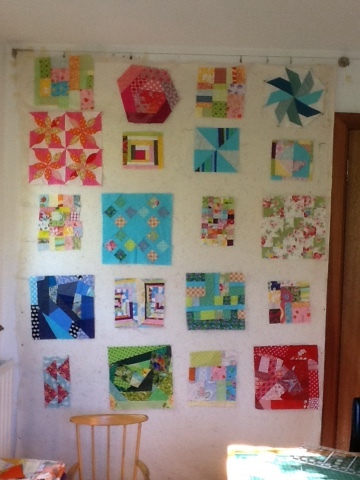 First I sorted them on my design wall. Then I squared them up and sashed them in the colour I was highlighting - to add more cohesion to my plan. 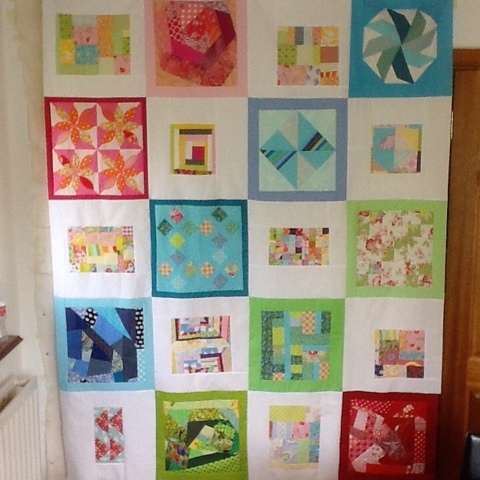 Then the multi-coloured blocks were sashed in white! It is scraps all the way! And here it is all bound and totally scrappy! 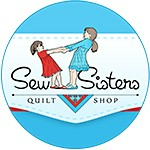 So you are wondering about the winners of the randomly drawn prizes for the May Scraptastic Tuesday monthly link. First, I know you would like to thank our fantastic and generous sponsors, who make this whole project a lot more fun by allowing us to share prizes with you every month. 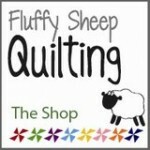 Fluffy Sheep Quilting - a €20 (20 Euro) gift certificate - #4 - Karen from Quilts...etc. Congratulations to our winners, and watch for an email about your prizes. Please plan to join Leanne from She Can Quilt and I for the June Scraptastic Tuesday link on the second Tuesday, which will be June 14. 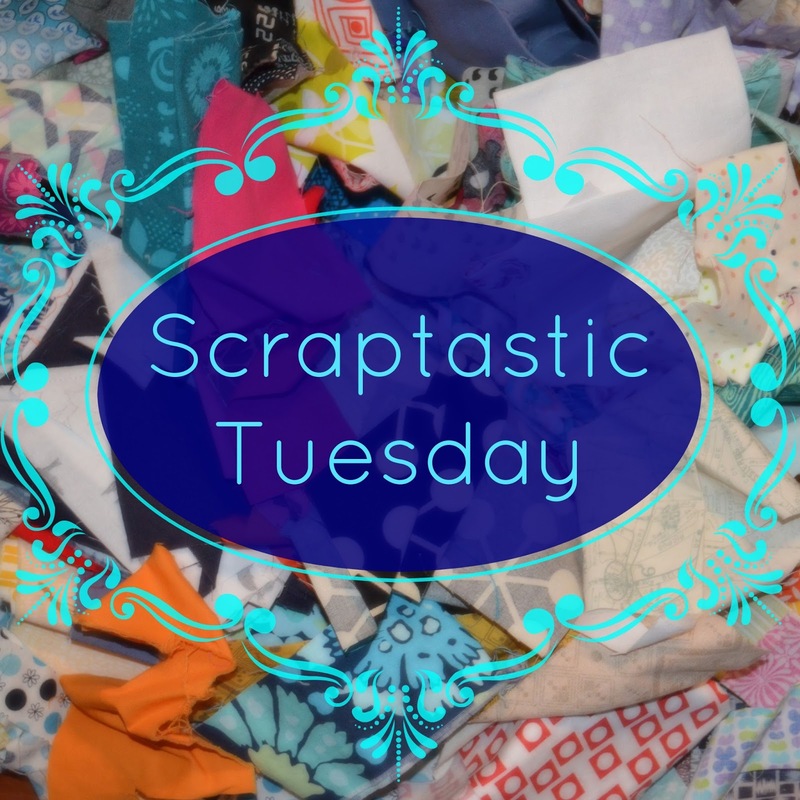 In the meantime, you can go back to check the May links for inspiration and share your scrappy projects using the #scraptastictuesday tag anytime. One among many that she sent me to use for Siblings Together. This one just said " make me the centre of attention". So I decided to make it the centre of a sizzling medallion in hot colours - orange, pink and maybe some yellow. 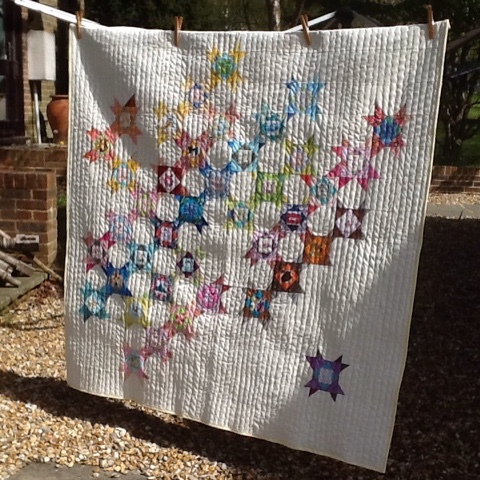 The scrap orange Stars came from the lovely Julie who always seems to conjure up fabulous quilts from scraps - she is truly inspiring. 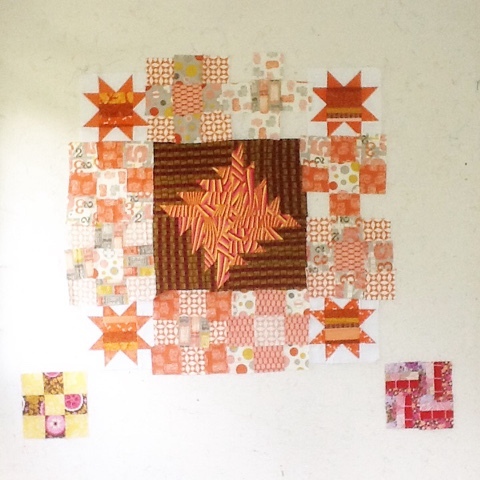 I made some simple nine patches for the first border, from fabric donated by Emma - mainly used up in the first Kaleidoscope quilt I made for Siblings Together. It is 2wenty Thr33. 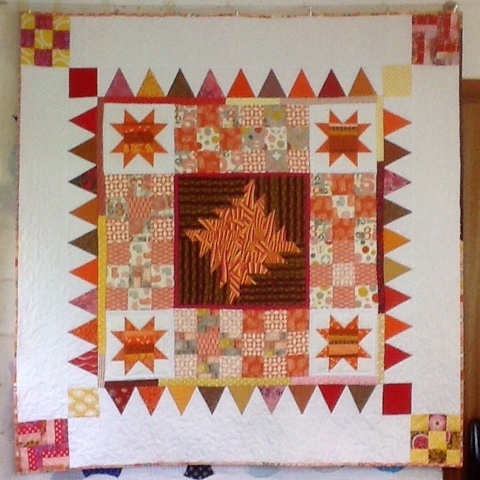 Once those blocks were patched together I added another scrappy thin border and then some triangles - to repeat the pointy-ness of the delectable mountain centre block and those star points. I think that border works well. I used a coloured square as my cornerstone. 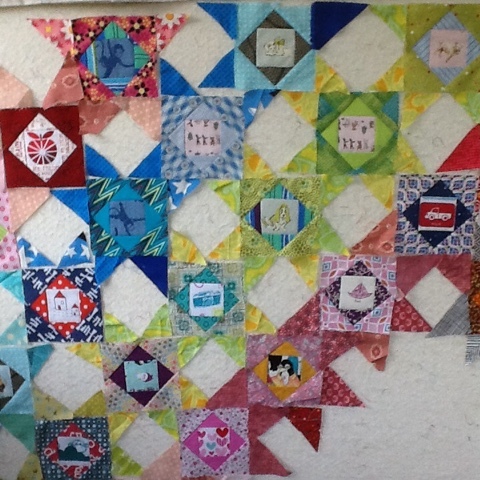 My final border was Kona White with cornerstones - two nine patches and 2 rail fence blocks - one of each was donated by Carina , the other made by me to match in as closely as my stash permitted. 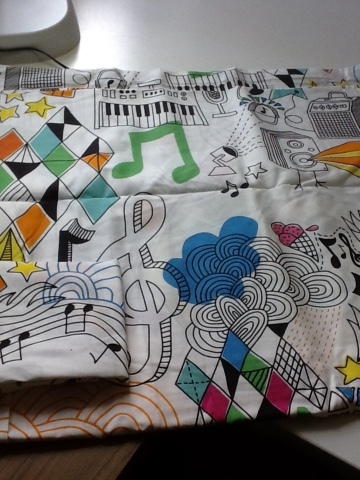 Jude sent me an ikea duvet cover that Sarah had sent her (I think) and it had all the right colours and a bold pattern as well! 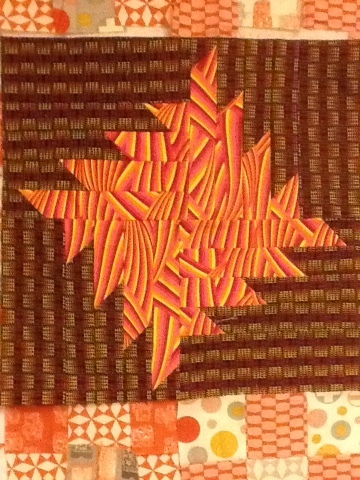 It seemed a perfect match for the backing fabric. 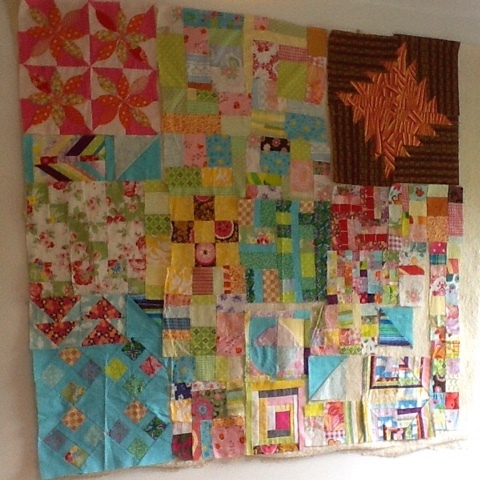 I quilted in the ditch a lot, crosshatched the nine patches and meandered in the outer border. 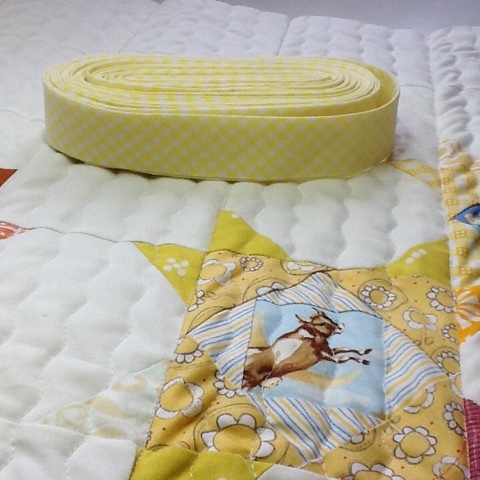 The binding was a scrappy one that repeated some of the 2wenty Thr33 fabric from Emma. 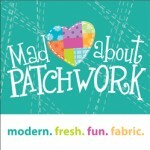 So I have been busy scrapping as usual but what have you been up to? A huge thank you to our generous sponsors for providing the following prizes which will be awarded randomly among those of you who link up. 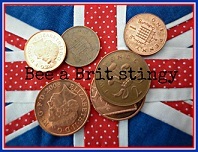 One link per person, and it will be your entry into the random draw for the prizes. 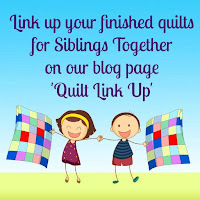 It is the same link up here and at Leanne's blog - She Can Quilt - so you only need to link up on one of our blogs. 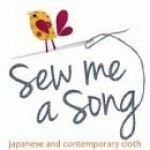 This link is to share with our community about using your scraps, please don't use it to advertise your own products or events. 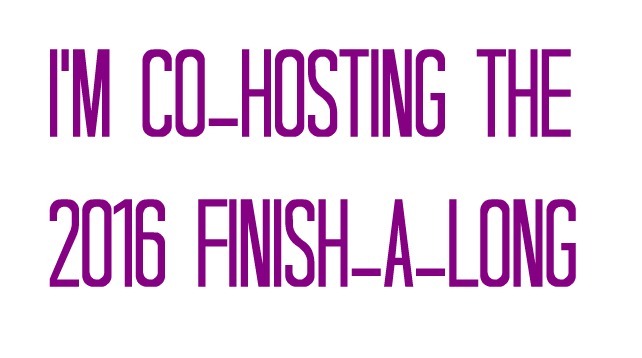 You can link up from your blog, instagram or flickr, but you have to link up to be entered in the prize draw. Use the Scraptastic Tuesday button and invite your friends to join us too. 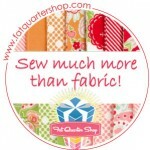 Please share our button, or a link or the hashtag #scraptastictuesday in your linked post or photo. If you have trouble linking up, let me or Leanne know and we will get you sorted. 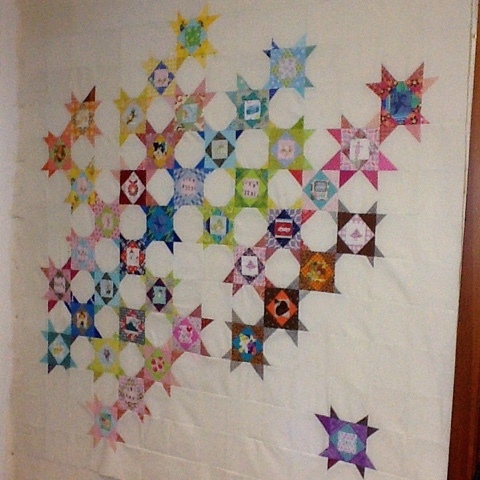 When announcing #scraptastictuesday winners last month I showed you this quilt top I made from 41 economy blocks. I was being economical with the blocks by making them into stars with an alternate snowball block, made from the cut off triangles left over from other blocks. I was even more stingy by adding lots of negative space around them. I actually love the look this gave me, all because I didn't want to fussy cut more economy blocks. Sometimes it pays dividends to think outside the box. 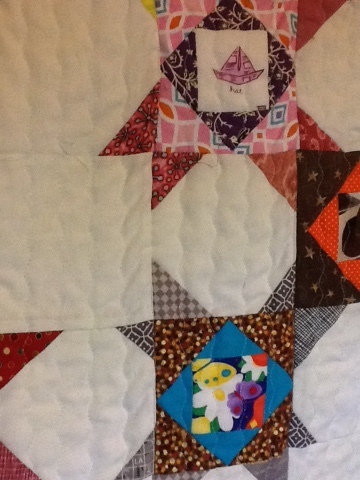 Anyway I quilted it with a serpentine stitch in vertical lines. It is a look I have often seen but never followed up on. Well I'm so glad I did as the texture this gives is amazing! 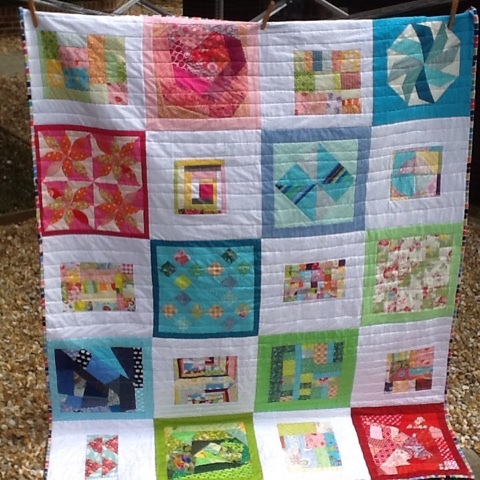 It does shrink it up somewhat so this quilt that was a bit small is even smaller now, but very snuggly. I used up the last of a pink floral fabric that I had on the back and went with a yellow gingham binding cut on the bias as I love the effect that gives though I didn't actually want the stretchiness. 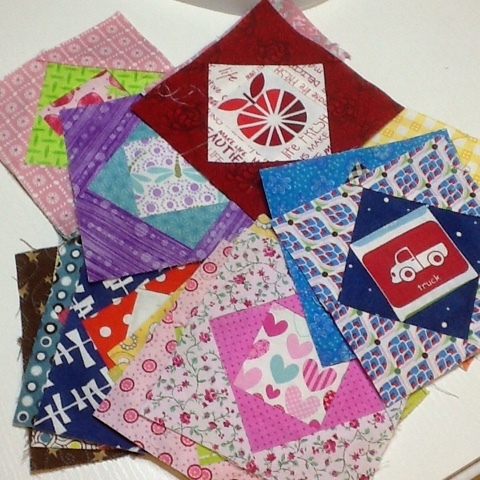 It started out as just a little pile of square blocks on my list here.